Greetings from your WoodWeek news team. Looking to markets where, in NZ commodity terms, forest products are bucking the primary industries trend as prices continue to gain. Wood pulp prices were up 13 per cent in the month on strong Chinese demand, low inventories and supply disruptions for other major suppliers. Log export prices were up 0.9 per cent. Change is coming down south as OneFortyOne Plantations announces the purchase of Nelson Forests. It is currently 100% owned by investment funds, through Global Forest Partners. History suggests change comes down there in years ending in a ‘7’. In the past week, the mainstream media has picked up a story portraying forestry poorly again – this time relating to employment standards in contract crews in a number of regions. Labour inspectors from the Ministry of Business, Innovation and Employment carried out audits of 34 forestry contractors across the North Island this year and found 20 of them didn't comply with at least one employment standard. In Northland, national forestry leaders have welcomed a government move to make foreign forestry investors commit to processing more wood in New Zealand. Forestry Minister Shane Jones made the announcement at a meeting of forestry industry leaders in Whangarei late last week. In other encouraging market news, the New Zealand carbon price hit its highest level in more than six years on speculation the Labour-led government is likely to lift a cap on the maximum price emitters pay. It last traded at $19.85 per tonne, the highest level since May 2011, according to brokerage OMF. Thanks to you, our loyal readers and advertisers, our readership continues to grow each and every week! 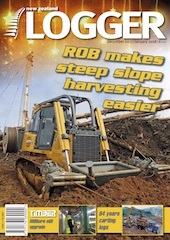 NZ Logger - Dec/Jan issue out now! Nelson Forests is currently 100% owned by investment funds, advised by Global Forest Partners LP, a US-based timberland investment management organisation. Nelson Forests manages 78,000ha of forest in the Nelson/Tasman and Marlborough regions and the Kaituna Sawmill near Blenheim. 2017 – Sale announced to OneFortyOne Plantations. Forestry audit reveals 'widespread' breaches in employment standards - Up to 59 per cent of the forestry industry may be breaching employment standards and that may not even be the full extent of it, according to a Government audit of the some regions of the sector. Labour inspectors from the Ministry of Business, Innovation and Employment carried out audits of 34 forestry contractors across the North Island this year and found 20 of them didn't comply with at least one employment standard. Data from the audit, obtained by Stuff, revealed breaches were "widespread" within the forestry industry and of even greater concern was that further breaches of minimum employment standards were "likely to be hiding" due to "poor recording". 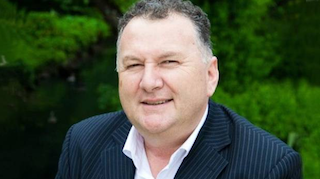 Forestry Minister Shane Jones has sent a warning to the industry saying it didn't end well for employers in the fishing industry "who were either oblivious to their legal obligations or took their employees for granted". The breaches include employees being paid less than minimum wage, not being paid the correct holiday entitlements or the right public holiday pay. Others included employers not keeping accurate time, wage or holiday records or having written employment agreements with all employees. Jones said while the safety record in the forestry sector had improved from the "bleak times of five or six years ago" there was still a "long way to go" with getting the basics right. That meant greater investment in the "safety culture" and training was needed. Forestry Minister Shane Jones made the announcement at a meeting of forestry industry leaders in Whangarei late last week. "As part of the coalition agreement, this Government has committed to an ambitious tree-planting programme that will require a partnership between the Crown and the sector itself. High-quality overseas investment can certainly help us achieve this goal,' Mr Jones said. The minister said about 70 per cent of the Northland's and the country's forestry interests are owned by overseas companies and he has had enough of raw logs being 'scooped up and sent overseas, with no value added to the New Zealand economy'. 'We want to get the trees into the ground as soon as possible. But it will take 30 years to get a return on forestry so we want to get the manuka in so we can start making honey and benefiting our people,' he said. Wood Processors and Manufacturers Association chairman Brian Stanley also welcomed the plans, saying this was an exciting time for forestry and wood- processing industries. Harvesting steep slopes using winch-assist technology is now firmly established in this country and while NZ Logger has sampled most of the new systems on offer there was one notable gap in the magazine's coverage – the Remote Operated Bulldozer developed in Northland, which is the subject of an Iron Test in the December 2017- January 2018 issue. 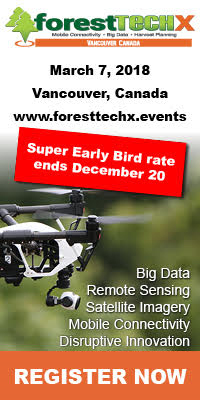 Also covered this month is the annual ForestTECH conference in Rotorua, which highlighted some interesting ideas and technologies that will become part of the fabric of forestry in the future. The magazine's quarterly focus on the New Zealand milling and processing sector looks at the recently upgraded sawmill at Millburn, now an essential part of the Pan Pac organisation. And a pair of Nelson-based log truck drivers who have clocked up 94 years between them are profiled. 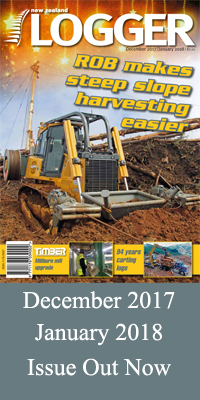 Plus much more, in the December 2017-January 2018 issue of NZ Logger, now on sale at selected service stations, or to subscribe for either the printed version and/or the digital version, visit www.nzlogger.co.nz. Robots could soon take over dangerous forestry jobs - Some of the most dangerous and labour intensive jobs in the primary sector could soon be done by robots. Skills shortages and attracting new entrants into harvesting operations is a major issue within the forestry industry right now. It’s been this way for some time and it’s not unique to any one region. In fact, the same issue is being grappled with in every other country with an active forest industry. Harvesting crews are continually being challenged by the lack of young skilled people available to work in rural areas. To address the issue, some forestry companies and contractors are now working alongside some of the technology institutes. The aim is get younger people trained in practical operating skills, particularly around mechanised harvesters. "We’re looking for early risers, hard workers and those interested in running and operating multi- million dollar forest harvesting machines" says the Southern Wood Council Chairperson, Grant Dodson. Monday this week saw the start of a new scheme in the lower South Island of New Zealand. 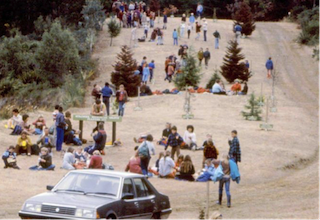 It’s aimed at helping train the future generation of forestry machine operators in Otago and Southland. In Otago alone, it’s estimated that another 40 logging crews will be required in just the next 6 years. One logging contractor, Mike Hurring, frustrated with the lack of trained youngsters coming into the industry, a couple of years ago purchased his own training simulators based on a John Deere mechanised harvester. It was set up in a purpose-built facility at Balclutha. The centre’s 12ha property in addition to the simulator and training room, allows hands-on experience on a loader, harvester, forwarder and a processor. 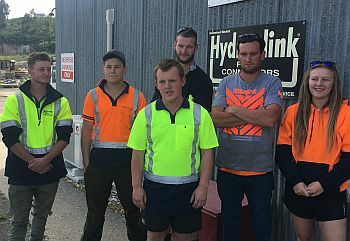 With the backing of local forestry companies and Competenz, the first group of six apprentices (photo) drawn from logging crews across the region started a new course at Mike Hurring Logging, under the experienced eye of Neville Muir. The apprentices will come together for five one-week training blocks over the next 10 months. They will concentrate on theory units, basic machine and chainsaw operation in the first week, with time each day set aside to use the simulators that have been set up in a designated operator suite. Following the 10 months of centralised training, apprentices who pass the course will come out with two level 3 qualifications, basic machine operator and manual processing. The intention is then they continue with normal assessments back in their crews working towards level four machine operator qualifications. "It’s hoped that if successful, that a second stream of apprentices will be put through the same training programme after 10 months" says Mr Dodson. This new venture could not have got off the ground without the financial support of forest owners and management companies these young people work for, Rayonier- Matariki Forests, Log Marketing, IFS Growth, and Ernslaw One. Mechanisation change needed - A major step change must occur to take mechanisation to a whole new level to help improve forestry safety, a forestry safety seminar has heard. Forest Enterprises’ Dan Fraser, who has been involved in the forestry industry here for close to two decades said it was time to lift the bar. 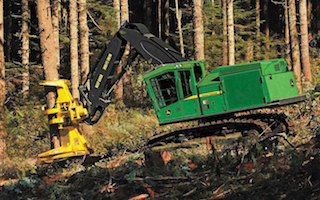 Forestry in Europe has been using remote controlled equipment — yarders, skidders and forwarders for more than 25 years. “On my first trip to Europe, a large-scale German logging contractor said to me ‘Daniel, I feel very sorry for your loggers — you dress them up like popsicles and you call that safety’. In response, they engineered new harvesting systems, Mr Fraser said. Here, we were not keeping up. European yarders have tension-monitoring systems on every rope to prevent overloads, ropes last for six years and are part of the hauler, not a consumable. Mr Fraser said in Europe, they continue to leap ahead and now have electric operating, based on the original remote-controlled design. “The power output of electric is phenomenal. It is cheaper to operate and an environmental step forward. However, Mr Fraser said right now it is not a simple step of ordering a machine. “European logging equipment is smaller and designed for harvesting smaller, lighter trees, so needs development. 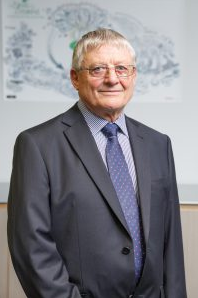 “Our Gisborne terrain has often difficult soil types and slopes posing further significant challenges,” he said. In the short-term, contractors needed to be banging on these manufacturers’ doors and showing the demand in New Zealand. Mr Fraser said future training demands should move away from basic chainsaw skills and incorporate sophisticated machine-operator training and teleoperation. “That is the future of this industry. We need to lift the bar so we are attracting more great people into this industry. Wouldn’t it be great to have more young people finishing university and choosing to work in the forest? A lot of excellent work had been done around safety but more rules and more audits were just another administrative control and in his point of view more “fluff around the edges”. John Deere equips certain tracked carriers with Final Tier 4 engines - The 900M-Series tracked feller bunchers and 900MH-Series harvesters have the new engines. With the required emissions change, John Deere indicate that their FT4 engines maintain power density, torque, and transient response; resulting in improved productivity, uptime, and more value for the machines. Fuel economy has improved and the design of the engine after-treatment system results in low Diesel Exhaust Fluid (DEF) usage. Deere state that one can no longer just talk about the improved fuel consumption of the FT4 final engines, but one must refer to overall fluid economy. If less fluid is used, there is less handling and storage requirements. John Deere has also made changes to the machine line-up, and improved the structure, design and horsepower on select machines. John Deere offers three 900M-Series tracked feller buncher models, the 903M, 953M flat bottom and 959M leveling machines, as well as two 900MH-Series harvesters, the 953MH flat bottom and 959MH leveling machines. All of the 900M-Series and 900MH-Series machines feature a redesigned engine enclosure, improving structural strength while maintaining good serviceability. In addition to all of the 900M-Series and 900MH-Series machines now having 330 horsepower (224 kW), the 959M feller buncher and 959MH harvester continue to have a good leveling envelope, maximizing operator comfort and performance requirements in demanding steep slope logging applications. Other updates include an improved LED work lighting option, and the expansion of the Disc Saw Felling Head option availability. This includes the 22-inch (56 cm) felling head, which is now available for all of the 900M-Series tracked feller bunchers. The John Deere M-Series and MH-Series machines are available with JDLink™ five years in base. JDLink remotely connects owners and managers to their machines and dealers, providing alerts and machine information to better manage where and how equipment is used. NZ carbon price hits highest level in more than 6 years as govt seen lifting price cap - The New Zealand carbon price hit its highest level in more than six years on speculation the Labour-led government is likely to lift a cap on the maximum price emitters pay. The price for a New Zealand carbon unit under the Emissions Trading Scheme last traded this morning at $19.85 per tonne, the highest level since May 2011, having traded in a range around $19.30 a tonne for the past couple of weeks, according to brokerage OMF. New Zealand is reviewing its emissions trading scheme, which currently includes a $25 per tonne cap on the price emitters have to pay the government for liable emissions. Green Party leader and climate change minister James Shaw told industry publication Carbon News that he expects to announce before Christmas the process to establish a climate commission, and that officials are about to begin work on outstanding issues from the latest review of the ETS, including the carbon price cap. Shaw told Carbon News that he believes carbon prices need to be higher than $25, although he noted the commission will have some say over those prices. "That's a pretty massive hint that it might be his intention to raise the $25 cap," said OMF carbon dealer Karl Arns. "The big question mark is around the government and what tweaks they will be making to the emissions trading scheme in the new year", Arns said, noting that Shaw's comments, although his personal view, are "a good signal". Arns said there was little volume available at current prices, with many sellers having traded their units prior to September's election for around $17-to-$18 a tonne. "There is not a whole lot of supply out there at these levels. The market is trading up because there are more buyers than sellers," he said. "A lot of sellers have done their volume and the market is just trying to find the level where there is more volume available." While emitters have to buy, foresters flush with cash from high log prices were in no rush to sell given the positive outlook for carbon prices, Arns said. Under Shaw's predecessor, National's Paula Bennett, the $25 cap was expected to stay for now to ensure major industrial emitters didn't face a spike in carbon prices, although Bennett had signalled it could be reviewed in the future. "That cap price was extremely likely to be raised at some point," Arns said. "Under National it was later rather than sooner, but under the new coalition government it's probably looking like sooner rather than later and it could be as early as next year. If they push that out to $30 or higher, then you are going to see carbon prices react immediately on the back of that." Arns said the outlook for the market was positive. "The price has reacted for a reason and with the government's review in mind it's hard for NZUs not to rally if that cap is lifted." Northport is celebrating its 15th anniversary. Cargo volumes at Marsden Point have more than doubled since the port opened in 2002 to a record 3.64 million tonnes last financial year. 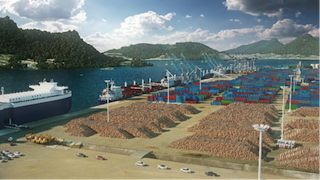 Ship calls have increased from 93 a year to 250 a year over that period, with berth occupancy now at a record 66.4 percent, up from 52.9 percent just five years ago. Mr Moore said Northport would need to grow if it was going to play a key role in the future growth of the upper North Island. “Importantly, we don’t need to expand northwards into the harbour. Instead, we can extend our existing linear wharf east and west,” he said. The vision Northport Ltd is making public today is based on many years of research, technical planning and engineering input from a raft of experts in this field. The company now has a good idea about what is physically and technically possible at Northport, and what isn’t. 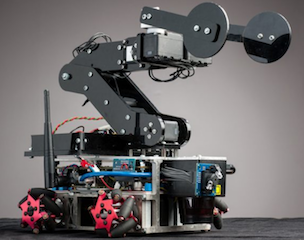 It has not put any dates to its decision-making process around possible growth. “We know full well that what we look like in the future will be shaped to some extent by our communities and our customers,” Mr Moore said. “So first we want to hear from these groups about what role they see us playing in Northland’s and the upper North Island’s growth.” This initial discussion period will be followed by further technical and environmental studies and modelling, and if there are no surprises the company will then embark on a detailed stakeholder consultation exercise. Three tourists were driving through Wales. As they were approaching Llanfairpwllgwyngyll on the Welsh island of Anglesey, They started arguing about the pronunciation of the town's name. “No no – it’s llan-fair-pi-well…” argued the second. “I think we need to ask a local about this,” the third sighed. "Before we order, could you please settle an argument for us? Would you please pronounce where we are... very slowly?"